Google Adwords online advertising platform is great for advertising national or local businesses, products, brands or ideas to people searching for those items on Google or to people visiting a website that displays Google Adwords ads. The Adwords platform works much like a normal auction, with different advertisers bidding on different search keywords or website placements. The highest bidder wins the top placement. The best placement has the best chance of having their ad seen and getting users to click and interact with their ad. Looking to get started advertising on Google Adwords for free? 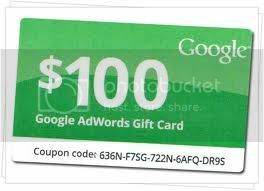 Enter coupon code: K7EC-VC4S-JS78-8SDC-YUA into the ‘Billing Section’ of your Google Adwords account for $100 in Free Google Adwords advertising at www.Google.com/Adwords. Hurry, offer ends March 15, 2012!